Relocating from the UK can be exciting, adventurous and utterly nerve-wrecking all at once. When you're faced with such a life changing step, you’ll have a lot on your plate with such worries as will I be able to integrate? Where should I send my kids to school? One of the things you are unavoidably going to spend a considerable amount of time researching and worrying about is: who should I trust with my removal? Unless you are completely emotionally unattached to your belongings, you would want to find a company that is reliable, helpful, professional and above all, trustworthy. Of course, pricing would weigh in as well. 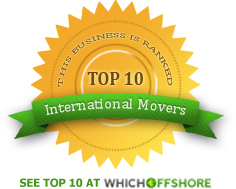 To help you with you with your research, we have put more than 70 UK-based removal companies to the test and compiled a list of the Top 10 International Removals providers. Choose the type of service: It is important to know the difference between part and dedicated loads. Part load removals are cheaper, as furniture is shipped at the same time as someone else relocating. Although it might take a little longer, as the companies try to coordinate shipments to the same destination. If you prefer it to happen faster, a dedicated removal might be the better option. Packing and Insurance: As many of the removal companies point out, packing itself doesn’t affect the quote as much contrary to what many people believe. You can save up a few pounds by putting everything in boxes yourself and only having the removal company pick it up, but you may miss out on insurance coverage. Plan ahead: Make sure you have every detail such as date, time of arrival arranged with the removal company beforehand. Packing always takes longer than you think it will. It is only when you start putting things in boxes that you realize how much you have gathered over time. Plan to pack well in advance, and give yourself extra time, just in case. Decide what to take: We all know that we keep a lot of things for sentimental value, nostalgia or just because you 'could use it one day'. Take some time to really consider whether it is worth taking with you, or if it might be time to bring it to a relatives' garage for safe-keeping. If there was a time to have a clean out, it's now. Make an inventory: When the time comes to move, it is easy to lose sight of everything you are taking with you. Especially if you're leaving items behind or storing them, create a list of what’s where for future reference. We’ve reviewed companies based on the information provided on their website, online customer reviews, ease of contact, helpfulness of the staff and ultimately time to respond and prices quoted. Quotes were compared from various companies on the basis of a family of 4 (two adults, two kids) moving a total of 1000 ft3 of contents from a 2 bedroom flat in London, to a flat in Barcelona - no elevators available at either location.